Which SketchUp book should I buy? That’s a question I get a lot, and if you have no experience with SketchUp, I recommend that you start with “Building Blocks of SketchUp”. That book starts with downloading and installing SketchUp and teaches you how to use the program using simple geometric shapes. That’s the strategy I currently use in my classes; we spend the first part of class playing with blocks and it shortens the learning curve considerably. 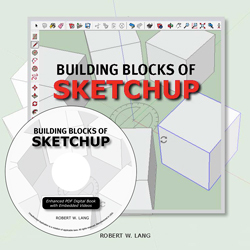 This book covers all aspects of SketchUp and includes a 40-page “SketchUp Tool Guide”. That might be all you need; when you understand the basics of 3D modeling, you will be able to create anything you want. 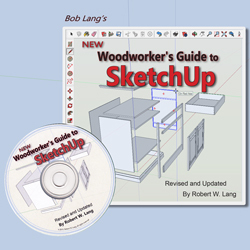 However, if you’re goal is to plan detailed woodworking projects, the “New Woodworker’s Guide to SketchUp” teaches you by working through typical woodworking projects. Starting with a simple table, this book shows how to add joinery like rabbets, dados, dovetails and mortise-and-tenon joints with fast, efficient and accurate methods. You’ll learn the easy way to add moldings and create turnings with the Follow Me tool, and you’ll discover the value of using components, scenes and layers to organize your model so you can get to the shop armed with the information you need to build your next project, including detailed prints and an accurate, automatically generated cutlist. Both books are in enhanced PDF format with embedded videos, available either on disc or as a download. Purchased separately the cost to you is $74.90 on disc, or $64.90 as a download. Buy Both Books Together and Save! 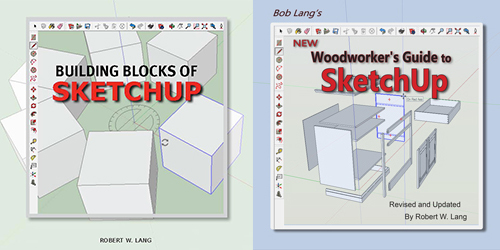 “Building Blocks of SketchUp” + “New Woodworker’s Guide to SketchUp” on disc $59.95 with free shipping to addresses within the United States. If you have already purchased either of these books, click here to contact us. We’ll hook you up with the other book at the bundle price! The yellow “Add to Cart” button is to purchase the bundle on disc sent through the mail. Scroll just a bit farther down the page to the blue “Buy Now” button to purchase as a download.